Mountain Lodge accommodation offers a private and romantic getaway in the Dandenong Ranges, surrounded by national parks and within easy reach of the many local attractions. Nestled on a one acre property, in the heart of the beautiful Dandenong Ranges, the two self contained luxury suites, provide boutique B&B accommodation with queen size beds, spa baths, a fully equipped kitchenette, and sumptuous breakfast provisions. Relax in front of the gas log fire, with complimentary chocolates and Port on arrival. Enjoy the privacy of your own balcony, surrounded by old growth trees and foliage, and marvel in the variety and colour of the local bird life that this picturesque and peaceful setting provides. 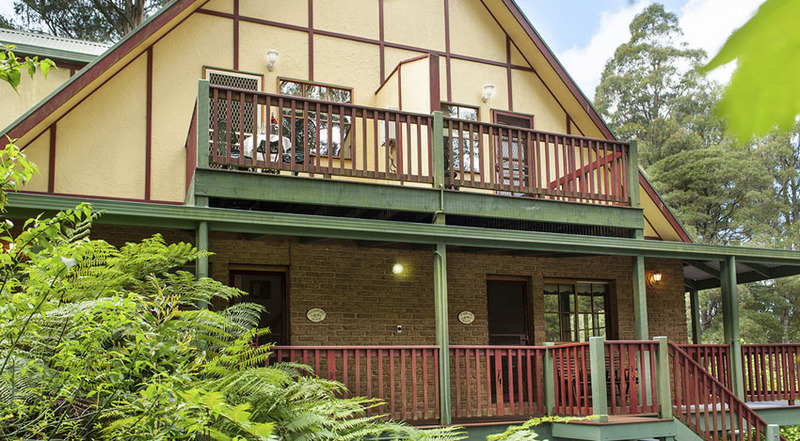 Mountain Lodge is ideally located at the top of Mount Dandenong, near Olinda village and within easy access to wonderful shops, cafes, antique stores, restaurants and local markets. We are also located within close proximity to a number of Dandenong Ranges reception centre's, making it the ideal location place to stay when celebrating these special occasions. There is an abundance of attractions and things to see and do in the Dandenong Ranges, and for those so inclined, we are within easy walking distance to the Olinda Falls access track, William Ricketts Sanctuary and Kalorama lookout, boasting scenic views of the Warburton Ranges and Silvan Reservoir. A short drive off Ridge Road leads you to the Mount Dandenong Observatory, for stunning views of the Melbourne CBD, particularly at night. Garden lovers will not want to miss visiting some of the many local gardens of Victoria close to Olinda, including the National Rhododendron Gardens, Alfred Nicholas Gardens, George Tindale Gardens, Cloudehill and Pirianda Gardens. A short 20 minute drive, will have you at the home of the iconic 'Puffing Billy' in Belgrave for a romantic steam train ride. The Yarra Valley is also within easy reach, where you can sample some of the many award winning vintages this region has produced. For our international and interstate guests, the Dandenong Ranges is only a 60 minute drive from Melbourne International Airport and just 45 minutes from the centre of Melbourne. We invite you to visit and enjoy the unique experience in the relaxed atmosphere our B&B offers, in the magnificent Dandenong Ranges, and we look forward to welcoming you to Mountain Lodge. two complimentary tickets to Kabloom at Tessalaar. Click on specials below for more details. Belgrave Big Dreams Market is on second Sunday of the month from 9am - 2pm at Hayes Car Park, Blacksmiths Way Belgrave. Hills Art Market is on second Saturday of the month from 9am-3pm Memorial Avenue Emerald. Montrose Craft Market is on the third Saturday of the month from 9am-1.30pm at the bottom of the Mountain. Gembrook Market is on the fourth Sunday of the month from 9am - 2pm at Puffing Billy Railway Station Main St Gembrook. For more information on whats on in the Dandenong Ranges see link below.